At RC Fasteners & Components, we stock threaded rod in 30 locations throughout the United States, so we could have some in your back yard! 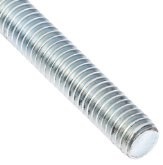 Our threaded rod comes in lengths of 1', 3', 6', 10' & 12'. We stock A307 Grade A, ASTM F593 304 Stainless, ASTM F593 316 Stainless and DIN975 Metric Rod in both Stl Zinc RoHS and A2 Stainless.